Since the development of photography and slides, the method of presentation has barely evolved. The learning environment of the future requires a platform that will afford more dynamic interactions in the classroom. I propose the Discovery Panel as that platform: a means to share inspiration, collaborate, present work, and receive feedback more effectively. 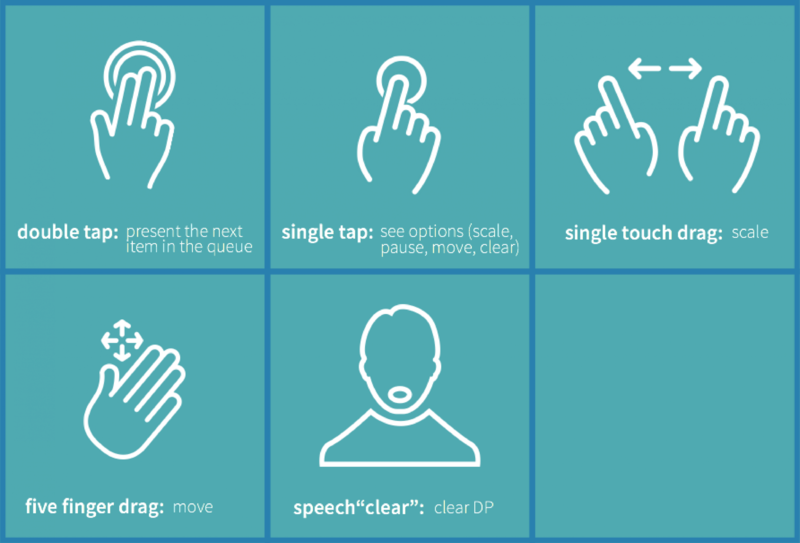 In this prototype video the presenter uses a couple of key gestures to queue each element and interact with them accordingly. This method of interaction allows for improvisation; much like playing jazz, the spontaneity of the moment to guides the presentation. The Discovery Panel system includes an online application for the user to create the presentation, as well as a mobile application that allows edits to the presentation or items to be queued in real-time. The Discovery Panel emerged from a need for a dynamic method of presenting my work. During our class sessions I often found myself wishing I could respond to questions or discussion by quickly queuing something to the screen. 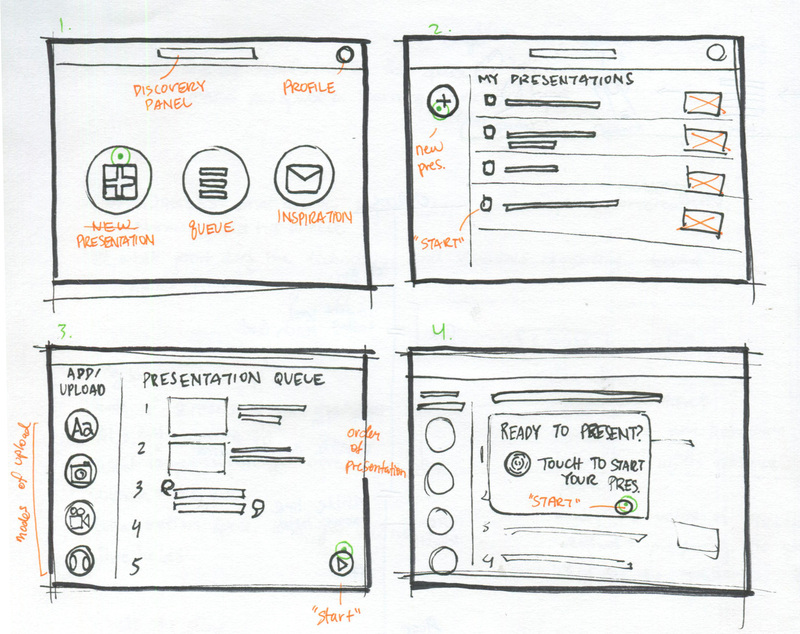 To solve this problem, I began with simple sketches to explore how I could interact with the screen as a platform of communication. Along the way, prototyping with a projector helped inform physical interactions with the board. Observations and research into the presentations methods of my classmates made it was apparent that the Discovery Panel would have to move beyond just a screen, to a system. The system included the process from creating your presentation, to presenting, to facilitating responses from the audience. This informed the narrative of my final prototype video. In this narrative a student uses the desktop application to create her presentation by placing media and text in a sequential order. When she is ready to present, she places her finger on the screen and her presentation is prepared by the discovery panel. As the student leads her viewers through her presentation, she is able to size the media, arrange it dynamically and show connections. At the end of the presentation when the audience asks a question, the student uses the mobile app to queue additional media to answer for the class. As I began to explore the opportunities a multi-screen display could afford, the arrangement of the screens became important in the efficiency of the presentation method. For both student and teacher, the Discovery Panel key feature is its cross platform functionality. This story board was the beginning of imagining a workflow, from a student's presentation creation, to class collaboration. For the student, this is where the process begins. Before a class session the student prepares his/her materials by queuing them on the Discovery Panel application. 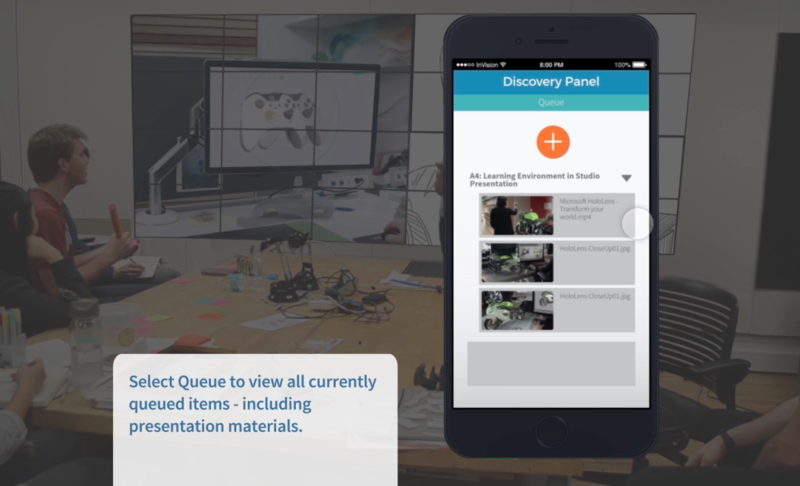 On the Discovery Panel mobile application, students and teachers are able to queue materials up, ready to be presented immediately, or after the set presentation. To feel how presenting on a display this big would actually be, I projected a display and did some test demos.